I sit in the stillness of a quiet evening beneath an amber flame, warming my bones from the frigid, damp southern weather. I have conflicts on these evenings. Yearning for a warm morsel, but my body cannot seem to move from the heat of the fire. So, like in any good relationship, I compromise. Throwing a wooly blanket around me, I swiftly walk to the kitchen like a fancy woman would in a long, tight skirt, except I am donning a plaid, woven bedspread. Nonetheless, I am on a mission. I crave the comfort of pasta, and not the skimpy sorts: the meaty, rich, velvety, luscious kind. I pour over the warmth of the flames from the stovetop as the sauces bubble and simmer. My spirits are instantly lifted. Ladling the white sauce over the dark, succulent meat sauce reminds me of the earth being blanketed by leaden snow. I gather up my vittles, traipse back to the fireplace, and gather with the ones I love over a warm, delightful meal. And in that moment, there is peace. In the midst of the chill, there is a gift, a gift of togetherness that both the bitter cold and the season bring. Give thanks for these moments when your heart and your tummy are both full and content. Put the carrot, celery, onion, garlic and parsley into a food processor and grind until the vegetables are smooth. Coat a large pot with oil and sauté vegetables until fragrant and soft. Add the pork and beef to the pot. Season with salt and pepper. Brown meat in the pot while breaking it up with a wooden spoon. Dust the tablespoon of flour over meat and vegetables. Add the stock, tomatoes and milk. Bring to a boil then reduce to a simmer. Cook uncovered for 1 ½ hours. Add Parmesan cheese and season to taste with salt and pepper. Toss in cooked pasta. In a small saucepan, melt butter and mix in flour. Cook for just a few minutes to cook out the “flour” taste. Add the milk and season with salt, pepper and nutmeg to taste. Keep on low heat and keep stirring while the sauce thickens. The sauce is ready whenever it is thick enough to coat the back of a spoon. In each dish, spread a few tablespoons of the béchamel onto the bottom of the plate (or on top if you prefer.) Serve the pasta over the béchamel sauce and top with fresh parsley and Parmesan cheese. Here, in a suburb of Atlanta, on a cold night it is sometimes so very necessary to have a nice bowl of something hot and flavorful to warm up those chilled bones. 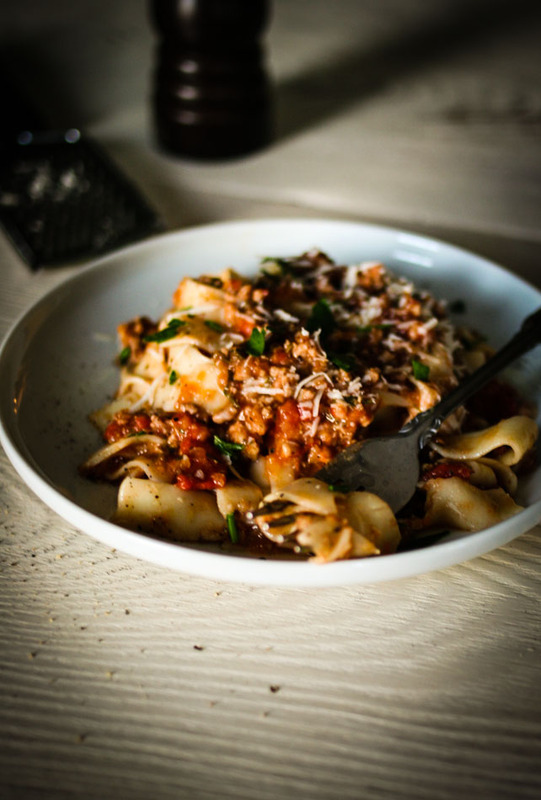 Pasta with a nice rich tomato meat sauce such as the Bolognese could do it for me too. Just one question, what is the purpose of the béchamel sauce under the pasta? Is it some sort of family tradition or something you do just because? Maybe you are going for something like the taste of a Lasagna, but wthout the layering and baking? I’m just trying to understand. The béchamel sauce basically adds creaminess to this meat sauce. It also adds a silky texture to the dish. These are also the same sauces that I use for my lasagna bolognese…but without the hour long baking process and making my own pasta. Basically,I am getting the satisfying, tummy-warming, lasagna feel without fuss for a lazy day! MMM!!! I absolutely love this pasta dish! 🙂 When I think about it, I can taste the sauce and pasta! I’m gonna make this really soon!! Goodness and heaven in the form of pasta! Thank you! It’s extremely comforting! Yum yum yum yum yum! This really is comforting, you can feel it when you eat a bite!